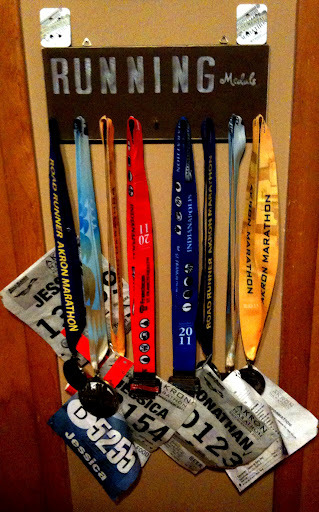 The running medals/race display shelf my hubby got me for Christmas 2011. I read that poem on “Fad” diets and really enjoyed it, so I thought I would share with the blogosphere. I am more convinced than ever that life is a journey. Far too often we want to take the microwave approach to everything. We are either all in or all out. We are either binging or dieting. One person I talked to the other day is on yet another “diet”. Over the years I have known this person they have vacillated between hundreds of dollars of vitamins a month, gluten free diets (with no allergies), all organic diets, and any other diet plan you can think of, but this person has always been overweight. They have yo-yo’d constantly. I’m always lending a supporting ear, but I am wary of people who declare they are eating nothing but meat. How sustainable is a life of only boiled chicken? Perhaps it is for you, but for me, I enjoy life. I enjoy eating. I am learning to enjoy and embrace the body God gave me. I feel that God wants us to find pleasure in food, otherwise he wouldn’t have given us taste buds. Food is fuel, but if that is all it was meant to be, God would’ve made us to inhale Goo full of nutrients and then race down the road of life. He put Adam and Eve in a garden full of delicious food and perfect plants, so don’t be discouraged if you love to eat. Just, learn how to eat well and take care of yourself. That means indulge and splurge sometimes. You’ll honestly get to the point where the indulgences become fewer and farther between and you will crave health food. I have literally been on a grapefruit binge lately because I crave the natural goodness. I am so thankful to be at the stage of my life where I desire to make the better choices most of the times. I am a woman though, so you know sometimes I just have to have chocolate, and not the healthy 90% cacao kind. I mean the kind piled high with fudge and ice cream:) You live only once on this earth, enjoy it. However, if you want to live a long, healthy, fulfilling life, learn balance and by all means, get off your tail and shake what your mama gave you. Exercise is one of life’s joys. You heard me right, JOYS! Who would’ve thought that some of my most prized Christmas gifts in 2011 were things I would’ve hated a few years ago? I got my running medals/race promotion display from my husband, as well as my Garmin 110 GPS running watch, and got a Runner’s World Calendar and running socks in our gift basket from the Bridge Church. I can’t believe I ever even survived without my running watch. I used to use the RunKeeper App on my iPhone and I would run with podcasts and music on. However, since I received my running watch I’ve been running “naked”. This means that I’ve been running with no music and no podcasts. I am so totally addicted to “naked” running now. In the chaos of life, I can’t even tell you how amazing it has been to be “present” and in the moment on my runs. The exception to this is anytime I’m on a treadmill. I MUST have something going to keep my sanity on treadmill runs. My average speed has increased slowly and steadily. I am now regularly logging sub 9 minute miles. I don’t think you can even understand the significance of this for me. I literally remember the first time I ran 5 miles in 60 minutes. I started crying and called my husband rejoicing. I never thought I would hit the 12 minute a mile mark on a medium run. (Medium for me is 5-8 miles) Now, I’m consistently getting sub 9 minute miles (ranging from 8:45-8:55 minutes a mile). My average overall is a 9:22-9:30 mile right now for my 5 miles and over runs. I need to amp this up if I’m going to hit my sub 2 hour half marathon, but even if I don’t make it, I know I’m getting fitter, stronger, and faster. No one can take away your running milestones. That is one reason running is so special. The only person you are in competition with is yourself and everyday you can see a better you emerging. Lace your shoes up and get outside. Start today. Start with one mile. Start with walking. It all starts by putting one foot in front of the other. That is the beauty of physical health, it’s not complicated. It’s kind of like salvation. People love to complicate life’s most simple messages. Salvation is by grace through faith, it’s not by your own works and physical fitness is just one foot in front of the other. Don’t stress with all of the “P90X”, “Insanity”, and “Crossfit” plans out there. I’m not knocking them. They are great in context, but sometimes we don’t need insanity, we just need to roll of the couch! One more thing I want to mention is that you have to find inspiration and twitter and facebook is a great place for that. Join some running groups either in real life or on social networking. It will help you eliminate all of your excuses. There is a guy I found on twitter that lives right here in Cleveland, Ohio that is my “no more excuse” go to guy. He literally gets up at 3:45 AM EVERYDAY to run. He is a “big wig” at a corporation and his wife is a pediatrician and they have several children and that is the only way he can fit his runs in. So,when my alarm goes off at 5:50 AM or 6:00 AM and I don’t want to budge and I feel sorry for myself because it’s 20 degrees and snowing outside, I know I can get on my twitter an see that he has already run 14 miles in the same weather and did it faster and more enthusiastically than me. This gets me going for some reason. His life is way more crazy than mine and he did it. He logs about 70-80 miles a week and while I don’t do that and probably never will, thinking about his tweets gives me the kick I need.